Why is the alignment of notes written this way? I've been playing a song wrong for a while now, and it's only when I took the time to slow down the music that I learned why. The alignment of the notes on the sheet music is different to how it the music sounds. However, when put through MuseScore, it plays the sheet music how the music sounds, indicating that it's not a mistake that the sheet music is written this way. I'm wondering if there are any symbols I don't know the meaning of, or if I'm missing some piece of basic music theory knowledge. Looking at the sheet music, why is it written the way it is? I'm including two photos. The first is the actual sheet music, the second is how that sheet music sounds. If you want to hear the song, the part I'm having trouble with occurs at 2:20. On musescore this is called mabinogi saga login theme. I would say: the author of the score on musescore.com intended the notes for playback by a human, and did not care to hack around in Musescore to get its playback exactly "right". ("Right" as in, to sound like they would play it themselves, or like in the original recording they did the transcription from.) The score in Musescore is a bit different from the one in the "OST" Youtube video, and the program's playback is probably not even what was intended. I can't hear much of an arpeggio on Youtube. Would any human player interpret the notes anywhere near like that? If the Youtube link to the original sound track is what was transcribed, then Musescored playback is plain wrong. Even the transcription is inaccurate, because I don't think there are any arpeggios. Maybe a different original soundtrack version was used for the transcription. Replacing the grace notes with acciaccaturas changes the Musescore robot's programming, try it and you'll see. You could also add arpeggio lines, which are wavy lines in the "Arpeggios & Glissandos" palette. For comparison, here's how Sibelius 6 interprets the same score, opened from MusicXML format (and after resetting layout and spacing). This is very close to how I would play it myself, except that the "rit." marking should be some kind of slowing-down (ritardando or ritenuto), but it doesn't seem to do anything. Imagine you are playing the harp accompanying a singer. Where would you place your chord? Before the beat, accurately with the beat, or delayed? All will be o.k. It’s just a question of interpretation and performance, or agreements between soloists, conductor and orchestra. Not the answer you're looking for? Browse other questions tagged theory piano sheet-music or ask your own question. 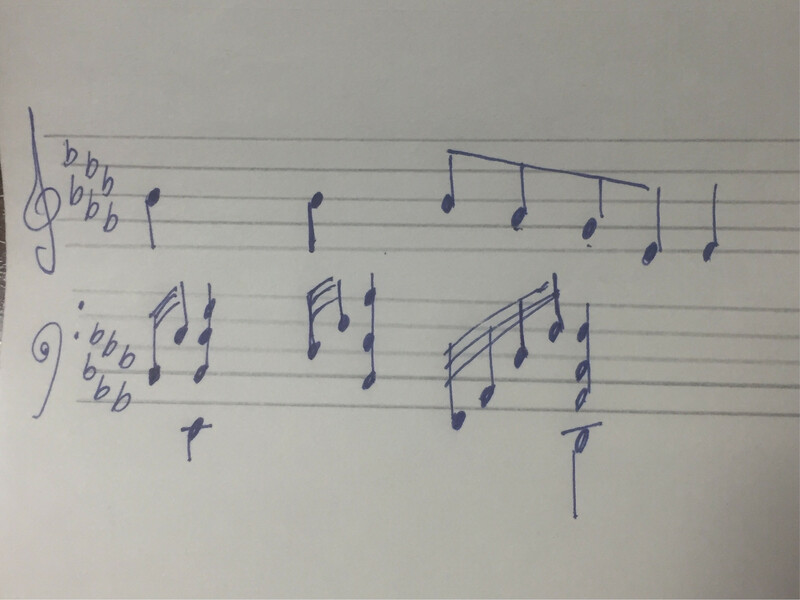 What's the meaning of a note before the time signature?